Oh my... wasn't it Christmas just yesterday and yet here we are with Easter almost upon us? Not that I'm arguing as chocolate rates rather highly on my list of life's necessities and I do believe my littlest man agrees with his mum! These photos were taken last Easter and have been on my 'to do' list ever since. 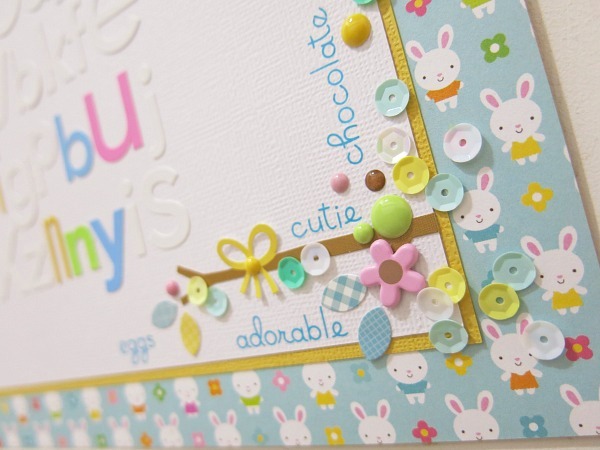 So when the new Easter Parade collection hit my desk I did a little happy dance at the sight of the 'bitty bunnies' paper. 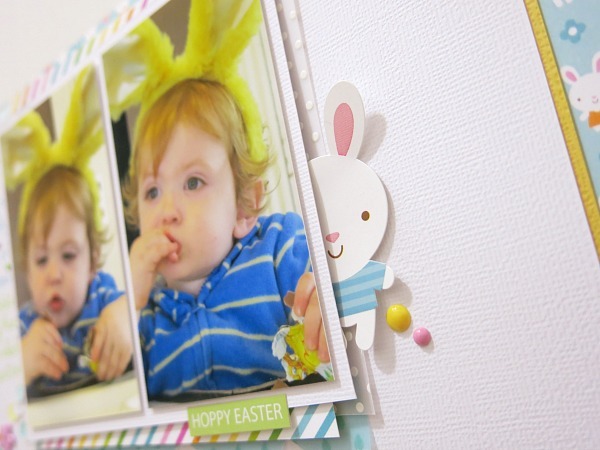 It was just perfect to use as a backdrop to the photos of my very own little Easter Bunny! I added two main clusters of embellishments that would draw the eye around the layout and in keeping with the Easter theme I used lots of sprinkles, sequins and brads to give a lolly shop feel to the layout. My title work was created using lots of alphas as I always seem to have sheets and sheets of oddments that don't really make full words. So I created a title within a random selection of alphas which used up quite a few of my leftovers. Now that I have finished last year's Easter photos I need to think about getting ready for the impending Easter of 2015... or perhaps I'll just leave it until the day before like I do most other years. Thanks for stopping by today and hopefully I have giving you some ideas to take with you. Melinda this is so fabulous!!! I love the little clusters & the title work!!!! Melinda - as per usual - this layout is full of super great details, with every single one of them perfectly placed!! 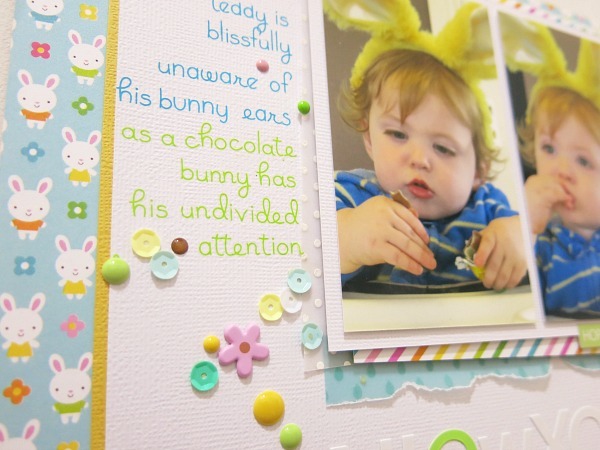 Love the way you used up your extra alphas to make such a superb stand out title for this adorable page of your "easter bunny" - so cute and just so fun!! Lovely Melinda - did you print your journalling right on the page? 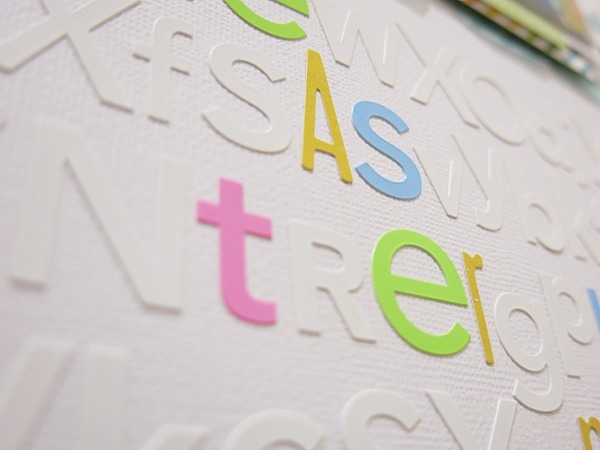 Hi Lyne, the journaling is actually Doodlebug 'Simply Sweet Mini Rub-ons'. Adorable as always Melinda ... you are always so creative! LOVE your title with the "spare" white alphas around it, LOVE your journaling and LOVE your SWEET clusters of embellishments - LOVE IT ALL!!! What a beautiful LO Melinda!! !